Hay fever season is coming, and along with it, zombie virus! 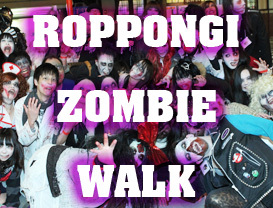 Come and join the Roppongi Zombie Walk during the hanami season on March 31 (Sun). Depart from "Night Gallery Cafe CROW" (across from Roppongi Midtown) and roam around Roppongi together! The bar will be open for participants to change and make up. Feel free to leave your belongings at the bar, leaving you free to enjoy yourself. Pay 2,000 at the bar to join the Zombie Walk, you'll get a free energy drink and makeup. 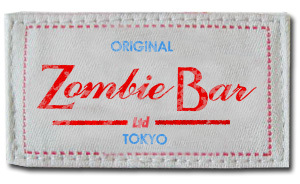 Also, the 1,500 Zombie Bar charge is free. Please check the information below for the meeting place and walking route. Let's enjoy a stroll around Roppongi as a zombie! If participants gathered crowd, entry is aborted sooner than expected. Start from "Night Gallery Cafe CROW"
* We do not accept seat reservations. * If it's crowded, please share your table. * Underage people may catch the zombie virus, so entry is prohibited. * The membership card is available. But you'll need to beg for it from the zombie staff. CHECK OUT Our Zombie Guide Line!! There will be a free Zombie Walk event in May open to any age. For further information, click here . Don't think you can get away with harassing girls as a zombie. 2. Keep Romero's zombie spirit in your heart! This is a walking event. Keep calm and don't rush! 3. Take you're trash home! Humans like to separate their trash. Don't fight their system, and please take your trash home with you. 4. Don't join if you don't want to get your photo taken. We may shoot the event to post on our website. If you don't want to be featured, please don't join the event. The Zombie Walk event will be documented by the official photographer. No one else without permission may take photos. 6. Register in advance! Don't just turn up on the day! We need to know the number of participants. Even if you get ready at home, please register in advance of the event. 7. Cancellation in case of rain. In the case of light rain, the event will go ahead. Please check our website or Twitter by 12:00 on the day. Here's the event from last year. Please take a look in advance. Make up and costume change starts from 1 PM. Last Sunday of every month is Zombie bar! ¥2,000 for the entry fee. please keep the wristband provided at the entry. Otherwise, entry. No underage admitted.Since this event is being organized by a bar, we cannot admit anyone underage. Sorry.